The Illinois Treasurer's race has seen a pretty visible momentum swing towards Tom Cross and his campaign to bring integrity and balanced budgets to the office of State Treasurer this week. First it was four newspapers endorsing him over Mike Frerichs. (Daily Herald, Quincy Herald-Whig, Northwest Herald, and today the Peoria Journal Star) Those are the only four papers who have endorsed candidates in the race thus far, and Cross has secured the trust of the editorial boards at every paper so far. 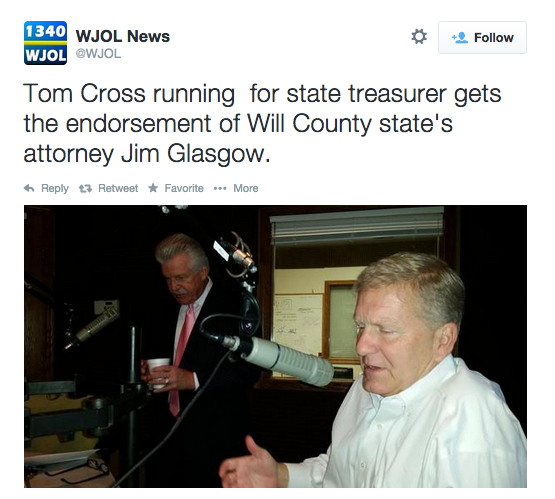 But, just this morning on WJOL in Joliet, (as you can see above via Tweet from @WJOL) Tom Cross made a joint appearance with Will County State's Attorney Jim Glasgow where Glasgow endorsed Cross' campaign. It is interesting not just because Glasgow is a very popular public official in Will County who does a good job as prosecutor (can you say Drew Peterson?!?) , but also because he is a Democrat. That makes three public officials - who are Democrats - to jump in with Tom Cross: Former Treasurer Alexi Giannoulias, Aurora Mayor Tom Weisner, and now Will County State's Attorney James Glasgow. The Democrat party is abandoning Mike Frerichs and standing with Tom Cross who has worked to build bridges across parties and will work for all of Illinois as Treasurer.